Kempston Rovers reached the first round qualifying of the FA Trophy with a 2-0 replay victory over Chipstead on Tuesday evening. After the two sides drew 2-2 on Saturday, back at Hillgrounds Kempston were ahead through Jamaine Ivy’s strike on 29 minutes. They held on to that lead until the very last seconds of stoppage time when Ash Fuller made sure of the victory. The result gave Kempston £2,500 in prize money and saw them drawn away to Ryman League Premier Division side Worthing FC on Saturday, October 29. At the weekend, Kempston had been leading 2-0, taking an eighth minute lead when keeper Martin Conway’s long clearance found Ivy who fired home. Two minutes later, Michael Lyon scored the second, only for Callum Maclean to pull one back on 33 minutes. The hosts levelled 10 minutes into the second half when Conway made a good save, only for Raheem Sterling-Parker to nod home the rebound. Chipstead thought they had completed the turnaround on 69 minutes when Sterling-Parker’s cross was deflected into the net. However, Kempston ensured a draw in the final 10 minutes when Munashe Sundrie’s cross was also deflected in by a home defender. 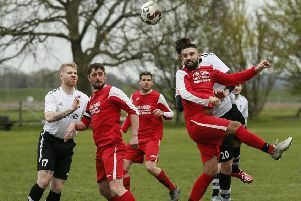 This weekend, Kempston are back in league action when they host Kidlington, while on Tuesday, the Walnut Boys entertain Biggleswade United in the Beds Senior Cup.